Interviews and expertise with Jennifer featured in television, film, podcast, radio, print, and web. Contact Jennifer for your story or documentary. By Nancy Joseph, Perspectives Newsletter (A Publication of the University of Washington’s College of Arts & Sciences), November 2011.
by Jenna Busch. Legion of Leia, 9 October 2014. By Abby Hamblin San Diego Tribune July 18, 2018.
by B.J. Priester. FANgirl, 2 November 2015.
by Kate Woodsick. 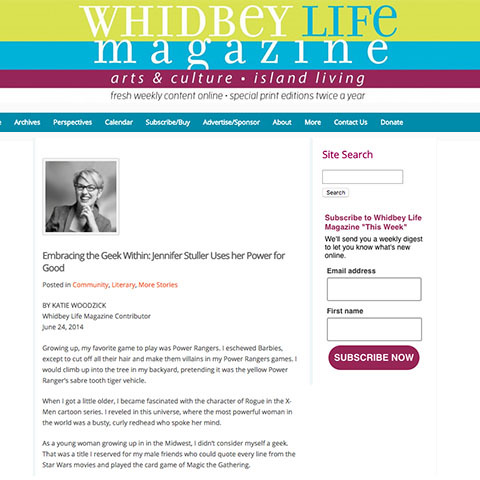 Whidbey Life Magazine, 24 June 2014. Minnesota Public Radio News, 3 November 2016.
by Lisa Granshaw. SyfyWire, 5 October 2016.
by Adrienne Fox. WatchPlayRead, 9 June 2015.
by Teresa Jusino. The Mary Sue, 6 June 2015.
by Terra Clarke Olsen. Seattle Weekly, 2 December 2014.
by Marcie Sillman and Hanah Burn. 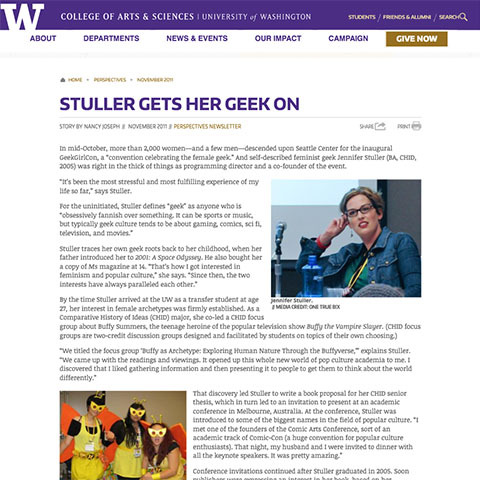 KUOW’s the Record, 10 November 2014. PRI’s and WNYC’s “The Takeaway,” 7 October 2014. The Beat Podcasts! 26 July 2014. In part three of More To Come’s San Diego Comic-Con special podcast, Heidi interviews Jennifer Stuller, organizer of Geek Girl Con about starting a con, the importance of community, and the fact that there are women in comics. by Karin L. Kross. Tor.com, 25 July 2014.
by Paul Constant. The Stranger, 5 October 2011.
by Mark Baumgarten, City Arts Online, 27 July 2011.
by Kurt Anthony Krug. The Seattle Times, 8 November 2006.